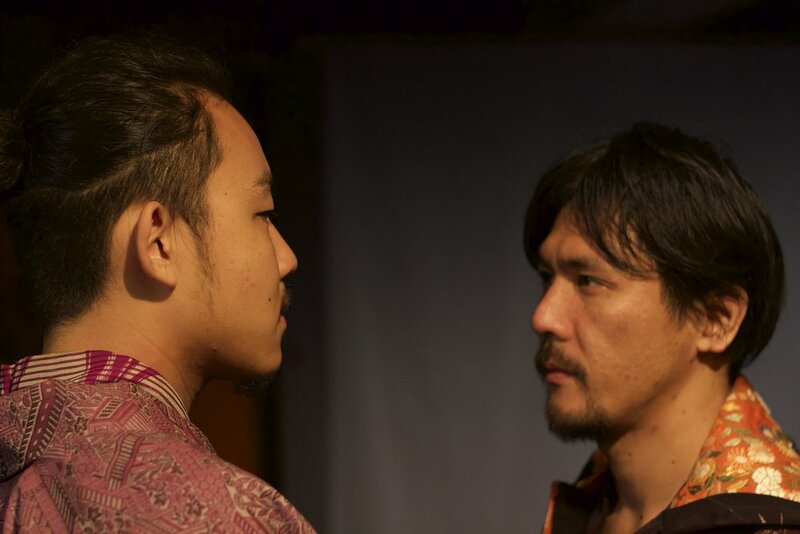 'Kaikin' is the second production in Japan performed by tusk theatre company, the company that is linked to NoQuatsch. The first one was ‘Sei shun’ - a play about hikikomori. ‘Kaikin’ had its premiere on 31st August 2016 in Kyoto, Japan, and visited other locations like the Iron Theatre in Kitakyushu and Hirado, Nagasaki prefecture. Actors from Kyoto, Tokyo and Nagoya work together on this intercultural project, with themes like belonging, isolation, crossing borders, and of course, love - and the lack of it. What bonds us - and what sets us apart is an important concept for theatre, as it touches upon a core human need for belonging, and concurrently the fear of isolation. Theatre project ‘Kaikin’ examines the impact -on both audience and performers- of aspects that create a sense of belonging or isolation. The project challenges the notion that in this global society we can belong anywhere, underlining that ‘other-culture-absorption’ and ‘own-culture-venerating’ bring up questions about our own identity. This exploration contributes to the understanding of intercultural theatre, while also scrutinizing cultural appropriation within theatre. A post-modernist English language play by the European theatre-maker involved -reflecting a personal journey into the sense of belonging- was translated into Japanese by its performers, initiating a rehearsal process of investigation into European and Japanese culture, rituals, communication and (communal) history. Japanese audiences were offered concepts of belonging through the storyline and framework of the scenes, including seemingly unrelated stories dealing with rituals, a brothel, folktales, and mythical creatures, questioning how memories are created that unite or divide us. Costume/stage design and music suggest cultural reminders, while encouraging construction of personal meaning. For the performers, the workshop-style rehearsals highlight the importance of use of specific language as a means of communicating ‘belonging’ and cultural adherence. Post-performance talks and audience-questionnaires connect the performance firmly to ‘love’ and ‘isolation’ felt after a deepening perception of ‘belonging’ – a response emphasizing the importance of tension and conflict, essential to this theatrical experience that gave many food for thought. This contemporary play uses a historical meeting as a starting point, but then makes it into a new narration. The title 'Kaikin' means 'lifting of the ban'. Between the 17th and 19th century, Japan was closed to foreigners, and Japanese citizens weren't allowed to leave Japan. According to the ruling Shoguns at the time, this was done to further peace in a country that used to be wartorn; this ban was lifted in the Meiji Era, which in turn meant the end of the days for Shogun, Daimyo and Samurai. The only westerners during the time of 'Sakoku' ('closed country') who were allowed to trade with the Japanese were the Dutch, and they were positioned on a small island, Dejima, near Nagasaki. 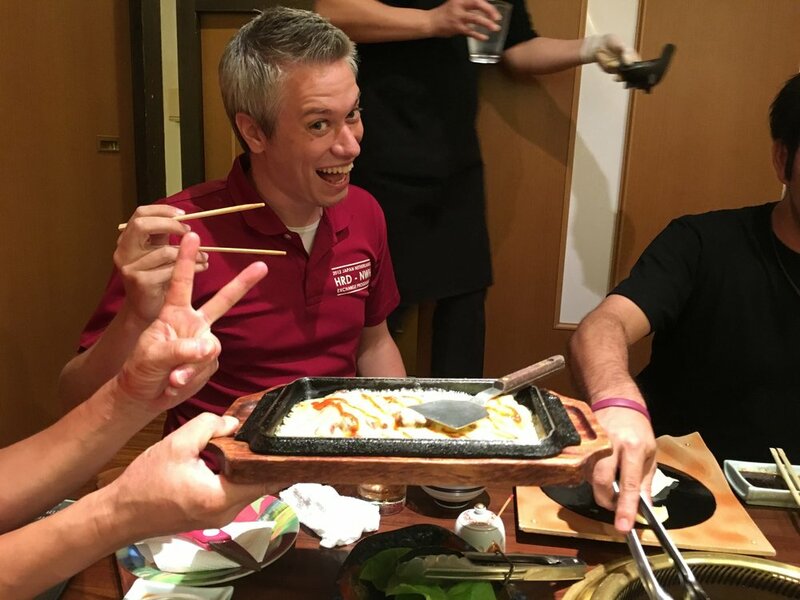 The Japanese authorities kept a close check on them and rules were strict. When a new head of the Dutch trading company (VOC) arrived on Dejima with his wife, this was seen as a breach of rules, and the wife was sent back. This real-life story (Titia Bergsma's story) has been reworked to show a woman arriving in Japan and trying to persuade the Daimyo to let her stay with her husband. 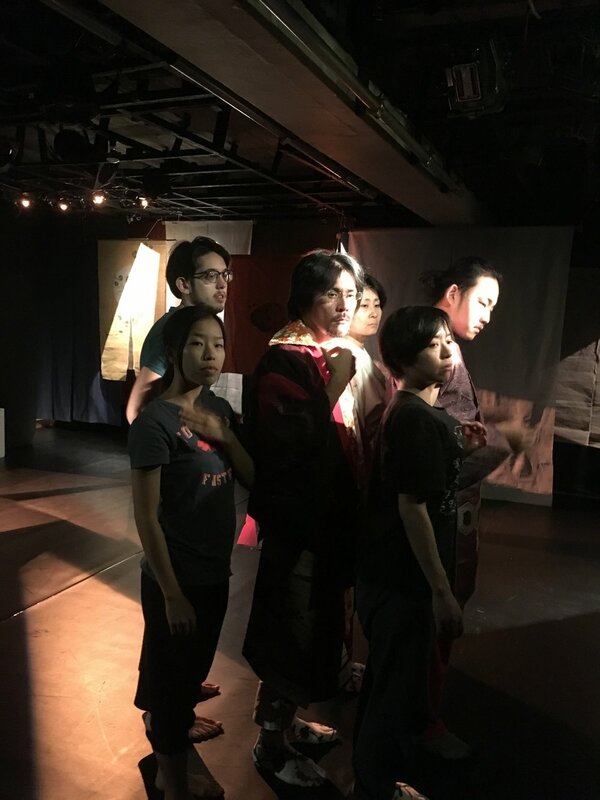 It's not only her story that develops during the play - the 5 Japanese characters are affected in different ways and some try to use the plight of Eva, the Dutch woman, to further their own causes. What follows is a journey that takes the audience to witness the realisation of our own life when changes are brought about through the mere presence of a newcomer. It makes us think where we belong, where our loyalties lie, whether we need to change our minds - and who is going to comfort us when we make mistakes. Is it the search for love that drives us through every decision we take or do we need to obey and do as we're told by those 'above' us, who could possible be governed by the search for love as well? Presently, the world is full of people who need to cross their borders and their boundaries to look for not just love, but a safe life. The fear that comes with encountering the new, the unexpected, the hostile, the warmth, the dreams and the nightmares, will be with these migrants forever - but with a 'global world' most of us move around and expect to find truths and love when we cross borders. How we are received at our point of destination shapes our experience, and those receiving us are equally shaped by their experiences. Where do we belong - and who can hold us back if we want to explore that idea? 'Kaikin' is structured in a loose format, giving space to the telling of a folktale, the introduction of mythical creatures and a thoroughly modern love scene. 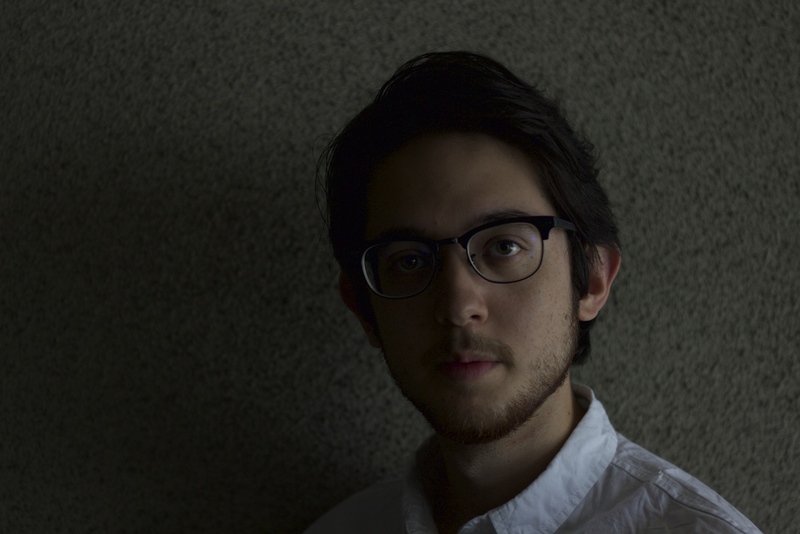 'Kaikin' is written and directed by Ellis van Maarseveen, and has been translated into Japanese by Junro Shibata and modified by all participants of the production. Please scroll down for more information on the story of 'Kaikin'. When his ill son is on the brink of dying, a harassed Daimyo is confronted by the Shogun’s decree that a recently arrived Dutch woman has to be expelled from Japan, despite the fact that her medical knowledge is what his son needs most. After his second in command turns out to be the one who made his son ill, the Daimyo must accept to abandon his ideals in order to team up with this ruthless commander to save his loved one, before he becomes disconnected from everything he loves and belongs to. Using the Dutch woman as a pawn in his plight, the Daimyo allows the ambitious commander to make the almost fatal mistake that he himself and his son, will benefit from. 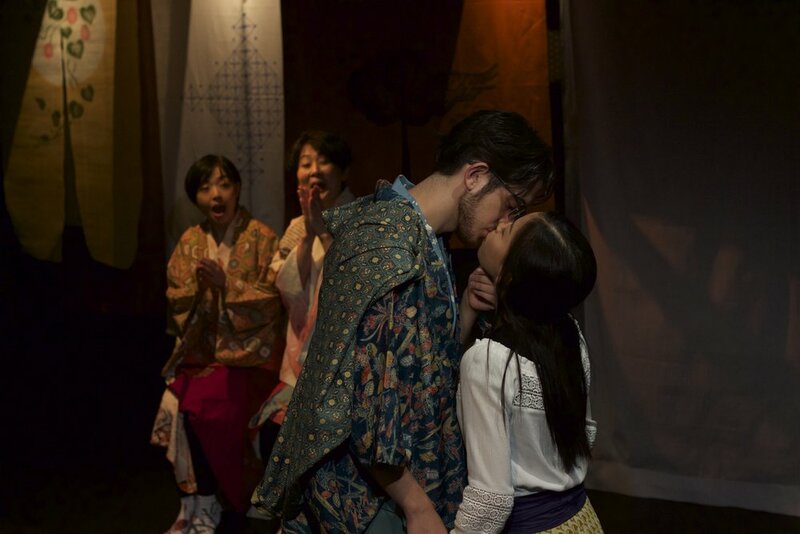 A plot of intrigue unfolds in this 10-act play, of which three acts seem to be unrelated to the story about Atsuhiko, his commander Masahiro, translator Kenji, the two women in Atsuhiko’s life, Eri and Makiko, and Dutch visitor Eva and her young, Indonesian servant, Maraty. This interrupted story-line format allows room for the telling of a folktale, the introduction of Japanese mythical creatures, and the transfer to contemporary settings with the aim of disconnecting an audience’s absorption into a story while supporting new trains of thought. The pace of the play fluctuates from poetic, sensual scenes to fast, almost comedic action, thus creating an organic attention pattern that communicates with the audience and which allows the audience to breathe, an element that is emphasized as theatrical momentum during the play. It needs to be noted that this is not plot-focused theatre: The story is used to convey the themes and serves as underpinning for the used theatrical approach, which doesn’t employ other media. Using a historical meeting as a starting point, this contemporary play focuses on themes including belonging, isolation, crossing borders, and of course, love - and the lack of it. Eva, the wife of the new Head of Commerce trading with the Japanese during the years when the Netherlands was the only Western country to be allowed to do so, is being told that she and her servant Maraty, have to leave Japan. As a woman she’s not allowed to stay, and Eva tries to convince the Daimyo to reverse that decision. When it emerges that Eva has extensive medical knowledge, the Daimyo becomes more interested in Eva, as his second son is very ill and needs different care than currently on offer. His commander, Masahiro, pretends not to know about Atsuhiko’s ill son, covering up the fact that he has a relationship with the son and is most likely to blame for his state of health. The Shogun’s decree for the women to leave Japan is unequivocal and Atsuhiko has to obey, but with invested interest, the two men set out to find a way to let Eva stay. In the mean time Maraty and Atsuhiko’s translator Kenji fall in love, while Eri and Makiko try to intervene with all the going-ons in Atshiko’s household. This includes showing their aversion of Masahiro, the moments of fear for the changes that foreigners bring, as well as their playing with the knowledge that Kenji has fallen for a foreign servant. Maraty turns out to be the illegitimate daughter of Eva and an Indonesian plantation-owner, a truth that was hidden to protect Maraty as well as Eva in a foreign culture. After Eva has been deliberately wounded by Masahiro when she stood up for her rights to be with her husband, her time in Japan is extended and she’s pressured into looking after Atsuhiko’s son, to aid continuation of trade between the Dutch and the Japanese. Eva and Maraty are eventually sent back to Indonesia, Kenji’s heart is broken, and Atsuhiko fears that his son’s recovery is going to have a set-back now his lover, Masahiro, is exiled. The lives of all characters have changed, including Eri’s and Makiko’s, who now have to deal with Atsuhiko’s doubts about his continuing service to the Shogunate and his own personal feelings of belonging, and love. Please support tusk theatre company by becoming our friends! You can do this by sending us an email - tusk.tc@me.com - with the title 'Friends', and we can keep you posted on open rehearsals and our activities. 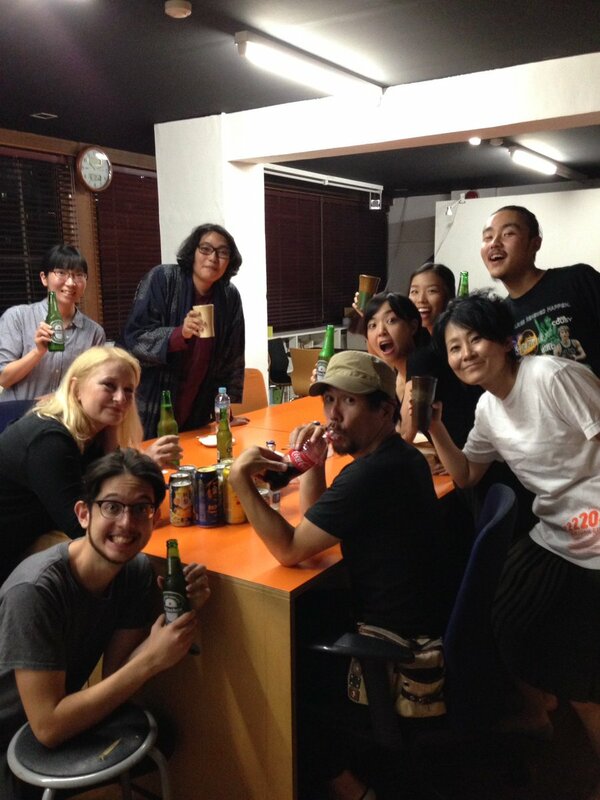 After our crowdfunding adventure via www.voordekunst.nl, the sponsorship we received from the Netherlands Embassy in Tokyo, and funding from the city of Kyoto, we invite you to join these generous sources so we can do more! Tomoko Takayanagi, Ciaran Hinds, Werner Tian Fisher, Erik Pals, Georgina Holt, Elske van Holk, Rembrandt van Maarseveen, Samuel Gwilym, Caroline van Maarseveen, Otteline Tuitel, Inger van Maarseveen, Hugo Maerten, Ruben van Maarseveen. 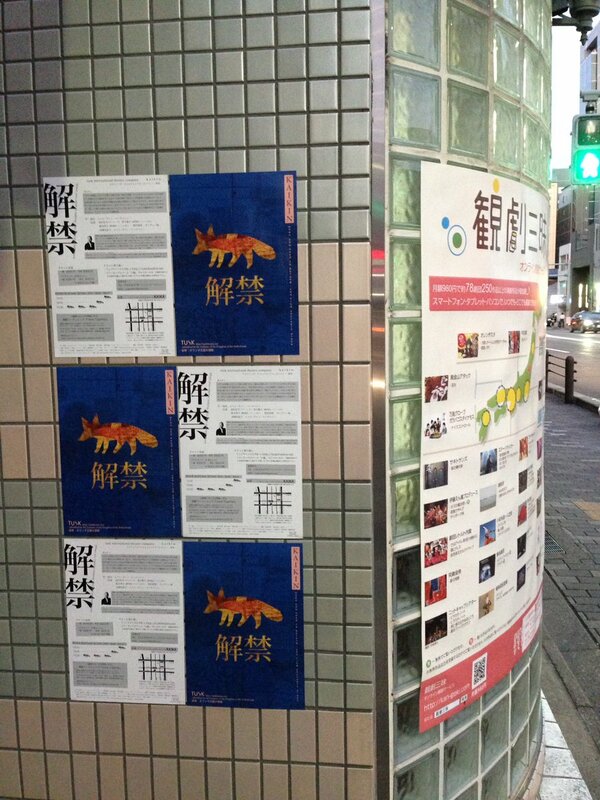 The performances of 'Kaikin' were well received in Kyoto, Kitakyushu and Hirado! The after-show talks that were held in Kyoto and Hirado were amazing, as we had guests that are renowned theatre directors/playwrights in their own right, which made it both nerve-wracking as well as exciting for us to hear what they had to say. We survived very well from those talks, thank you! We traveled around 2000 kilometers to get from Kyoto to Hirado and back and all was done in a van, which gives the feeling of being some traveling theatre group. As you can imagine, this was also quite tiring, but we managed to hold our energy until the last moment when we unpacked the van again in Kyoto, at Kaika theatre. Next project? We'll keep you posted. * A week before the first night - approximately, as I'm losing sense of time. The stage is in the process of being built with the elaborate backdrops that will be hung up; we're using the idea of many curtains by taking the Japanese 'Noren' curtain in plenti-fold to serve as a back. We have no set as we move around too much, just boxes that serve many purposes. The costume designer is on the ball and will come down from Osaka this week with her creations. We're all looking forward to that, of course. In the mean time, much hard work has been done on the scenes, the transitions, the movement pieces and of course, the thinking behind the text. One of the actors said that if anything, the work he's doing for this play might well kill him. This was a joke (thank god) but Japanese actors work very hard to make a living and sometimes to several performances at the same time; working on this production is an energy challenge. We hope it's going to be worth it for the audience. * About 2 weeks to go before the first night. Kitamura san from Kitakyushu dropped in yesterday to talk to us in Kyoto; it's always amazing how much work goes into a little tour. It seems all is on track and we shared some nice food and beers with him and with production people from the ever-helpful Kaika theatre. Although it feels as if there is enough time, we all know we're getting tired and need to rest and have time to learn lines too. 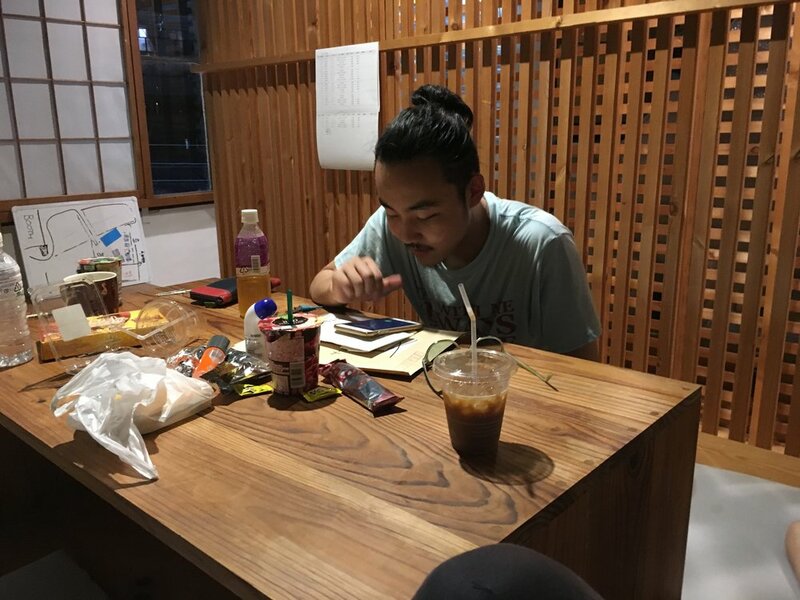 In Japan you can ask actors to rehearse as long as the director/producer wants to, but some stricter union rules might be good for us - rehearsing from 10 in the morning until 10 at night is not always conducive to good health and the best performance. So far, these long hours have given us plenty of time to explore and set up. Now it comes down to the nitty-gritty and we have a great performance ready for our audience on the 30th August! * The movement outline is more or less set, with every intention of changing it if it doesn't work; but it gives us a firm hold on the work on hand, which is how to use the text, how to interpret it, how to illuminate it and how to bind it together to make a great performance. Easier said than done, but there's a lot of people at work who either know what they're doing or they have visions on how it might be done - and if you combine those forces, you're in for a treat as a director as well as an audience. * We had meetings with the stage manager, light designer and costume designer - and all seems to be on course. More about that when I get it. * We're two weeks into rehearsals, and the play is taking shape thanks to the relentless energy of everyone ready to workshop all the options for this physical theatre performance. 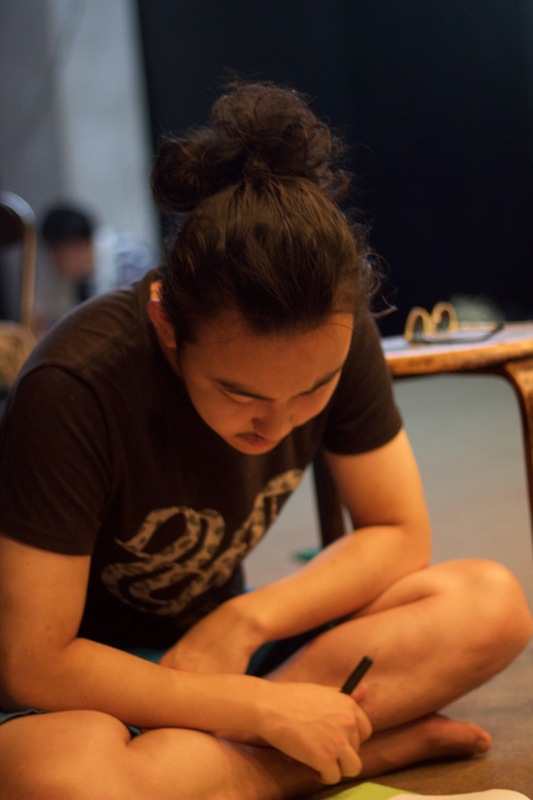 The text of the play is tweaked at all times to make it the best, and most applicable, Japanese possible - it sometimes feels like Lost in Translation, but maybe it's better to say Found in Translation. There still a lot to do (a lot) so we keep going - please follow us!